Like a chewy candy on their own, Medjool dates are awesome for stuffing, or for slicing, slivering or chopping to add a hint of sweetness to desserts or savory dishes. Even though dates are available all year long, we seem to pay attention to them only in the fall and during the holidays. 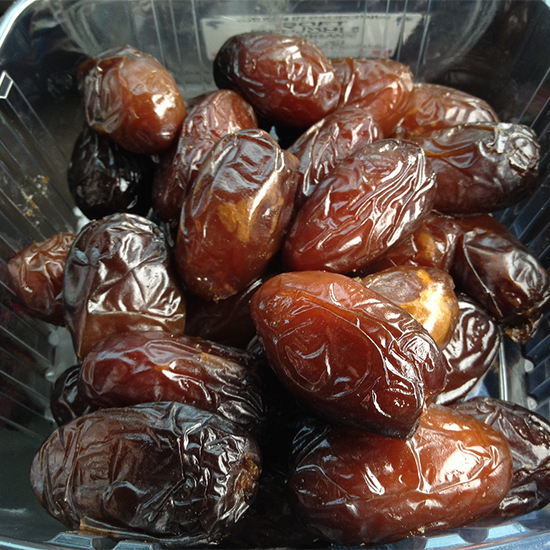 In spite of the fact that there are myriad varieties, the date we see most often is the deglet noor. They’re slender and chestnut-colored, and in my experience, they tend to dry out easily. For this reason, I never fully understood the magic of dates until I tried Medjools, which are deep-dark brown, moist two- or three-bite wonders. They’re like a chewy candy on their own, and super easy to pit. They’re awesome for stuffing, or for slicing, slivering or chopping to add a hint of not-too-sugary sweetness to otherwise savory dishes. Just be sure to give them a little squeeze to make sure they’re nice and tender before you buy them. No list of date recipes would ever be complete without the amazing English dessert known as sticky toffee pudding (which, if you’ve never had it, is neither really sticky nor what we would call a pudding on this side of the pond). Here are some of our favorite recipes featuring dates in every part of a meal, plus the quintessential date dessert from pastry chef David Guas.